Stacktool is no longer maintained; please read about its successor here. Stack overflow is what happens when an execution stack smashes memory that is being used for other purposes. This is rare for programs running in a process under a general-purpose operating system since these OSs use the MMU to provide transparent dynamic expansion of the stack. However, stack overflow is a common source of crashes in embedded systems that have relatively little RAM and often lack an MMU. Stack overflow is difficult to diagnose because the worst-case stack size is typically encountered only rarely, for example when several interrupts happen to be signaled at almost the same time. 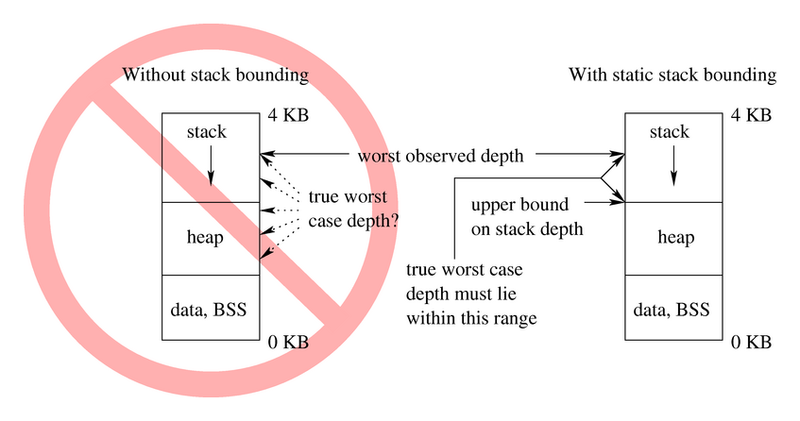 The typical ad hoc method for choosing stack sizes is to add a fudge factor to the largest stack depth seen during testing. This is potentially wasteful, since the fudge factor may be too large, and also unsafe, since there is no guarantee that it is large enough. The compiler has considerable freedom when performing the translation. Source code for libraries and the RTOS is often not available. Inlined assembly language is common in embedded software, and a sound analysis must account for its effects. Furthermore, whole-program analysis across compilation units is inconvenient -- it's much easier to let the linker do its job and then analyze a program that has no unresolved references. For simple embedded systems, analyzing stack size is almost trivial. For example, I spent a few hours writing a Perl program less than 350 lines long (available for download below) that can analyze embedded programs for AVR microcontrollers that are structured as an infinite main loop plus interrupts. For example, it does fine on the onboard control program flybywire.elf from the Autopilot project. Adding up the individual stack requirements of main() and all interrupts, a simple approach that tends to overestimate stack depth. A whole-program analysis of stack depth taking interrupt masks into account, where these masks were computed using a context insensitive analysis. This approach does better, but procedural aliasing hurts its accuracy. A whole-program analysis where interrupts masks were computed using a context sensitive analysis. For the set of programs that we looked at this analysis could successfully identify a concrete value for the interrupt mask at almost all points in each test program. This means that very little extra precision could be gained by moving to a more powerful analysis (such as one that models the store in addition to the registers). Here's a graph (png, jpg) showing the differences in accuracy between the three approaches when applied to a bunch of programs written on TinyOS, an executive for wireless sensor network nodes. a standard whole-program inlining heuristic designed to produce a reasonable balance between performance and code size. The EMSOFT paper contains more details about the inlining experiments. The "stacktool" is due for a name change as it has become a fairly general-purpose analyzer for object codes. For example, our current internal version (as of July 2004) supports pretty good worst-case execution time analysis. Pointer analysis is in the works as well. We are increasing the size of the set of programs whose stack depth can be successfully analyzed. Current rough spots are indirect control flow, recursion, fancy manipulation of the stack pointer, and fancy manipulation of the interrupt mask. Please send us bug reports, feature requests, experience reports, etc. This is supported research software! It is known to work fine on Linux, FreeBSD, and Cygwin. It properly analyzes most of the TinyOS example kernels although it still fails on a few of them (but never silently, as far as we know). We know how to solve the problems that lead to analysis failure and are actively working on fixing them! Analyzing binary programs is hard, and stacktool sometimes needs some help. Question: What do I do if I get an error like this? Answer: First, this uninformative error report has been improved in the CVS version, which will appear on the web presently. The problem here is that at address 0x7122 in your program, stacktool cannot reliably determine the value stored in the stack pointer. You will need to dump the asm for your program (i.e., by typing avr-objdump -d foo.elf) and look at the address where the problem occurred. If the code at this position is in a gcc intrinsic function such as __divmodhi4_exit, then you will need to build your avr-gcc after applying this patch. The patch simply cleans up a bit of excessive ugliness in the intrinsic code. If the problem was not in an intrinsic, or if the patch does not solve the problem, then drop John Regehr a line, including your TinyOS elf file and app.c as attachments. It is important that if you use the "prefix" option to configure, that all three programs are installed with the same prefix. Answer: The short answer is that this is probably easy to fix, please mail your TinyOS elf file to John Regehr. The long answer is that the AVR's non-atomic stack pointer accesses create major problems for stacktool, which falls back on pattern-matching the compiler output. This works because avr-gcc has only a few idioms for stack pointer manipulation. Answer: The most likely reason is that gcc turned a switch statement into a jump table, which stacktool cannot currently resolve. Solving this problem from first principles is hard and a pattern-matching solution seems too ugly, so jump tables are unlikely to be supported in the near future. The workaround is to give the -mno-tablejump option to avr-gcc. Question: What do I do if I get an error that is not mentioned on this page? Answer: Please mail two things to John Regehr: the elf version of your TinyOS app, and the app.c file that nesC places into the build directory. I'll take a look and see if it's feasible to support your application. Question: Will stacktool ever support msp430 or ARM? Answer: This would be great! It would be a considerable amount of work. I don't have time.